An IPA of quaffable strength, copper coloured and single hopped with Citra hops. Super aromatic grapefruit and pine aroma with some sweet malt followed by the flavour of pineapple more grapefruit and tropical fruits. Big and pungent with a robust bitterness… BOOM! Huddersfield Oktoberfest 2016. Has plenty of citrus that provides a little bit of activity in the palate, with a long bitter finish. Cask @ GBBF 2014. Gold pour with a small head. Nice lemon sherbet on the nose. A bit of herbal biomass. Citric hoppy personality. Flavor is similar. Lemon jellies. Crisp biscuit. Lightly bitter dry finish. Snappy and easy drinking. Nice golde. Great stuff and reasonable on the alcohol, so you can have more than one.....or two. Cask conditioned at Leicester Beer Festival ’16. Amber with white head. This was certainly a hop led beer, tropical fruit notes, refreshing bitterness, tangy and clean tasting. Certainly a very tasty beer. Cask at Akkurat. Pours amber with a rather firm head. Taste of pine, lemon zest and malt. Balanced and smooth. Cask, The Sussex Arms, Twickenham, 14th November 2015. White lacing. Golden appearance. Excellent dry hopping. 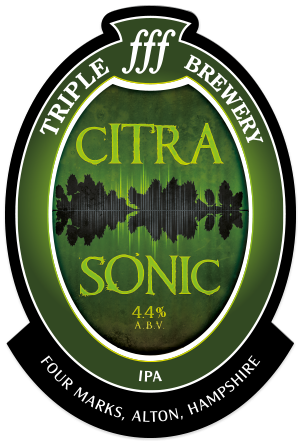 Lovely Citra on aroma. Hop resin and pine. Taste is soft malts, pineapple and grapefruit. Some tutti-fruity too. Clean and sessionable. Excellent. Superb golden ale. Great use of Citra. Fantastic work. Tasted for the first time in the real ale tent at Victorious, Portmouth. Best bee of the day for me. Finest kind. Cask the Ivy House, Alton. Simply delicious golden/amber beer. Hoppy, malty,tropical fruit and with such a length of flavour and balanced bitterness and only 4.1%. Bags and bags of flavour. My first sip and Wow!!! Sampled @ GBBF day 3. Clear orange color, small white head. Smell and taste malts, a nice hoppyness, fruity, citrussy, nicely bitter. Nicely balanced, decent body, suitable medium carbonation. Cask at Akkurat, Stockholm. Somewhat hazy golden beer with a decent offwhite head. Fruity hop aroma, grassy, citrus, apples, pine apples, grapes, pear, grassy, floral. Hoppy floral flavor, grassy, hay, citrus, pine apples, peach, passion fruit, some grapes. Refreshing beer. Cask at the "Summer of Love" Festival at the Rose & Crown, Sandhurst. Amber with a ring of white head; grapefruit aroma; grapefruit and tropical fruit taste; and a touch of spice to finish. Really crisp and refreshing. Tried this for the first time at the beer festival at "The Hawkley Inn" yesterday (7th June 2014). My absolute favourite of the 20 beers on offer. Beautiful golden colour and lovely bitter taste. If you like IPAs give it a try. Cask, The Slug & Lettuce, Leicester. Hazy golden with a bubbly head. Aromas are woody and floral with spritzy lemony yeast and herbal notes. Biscuit with mellow oranges and grapefruit. Light melon and white grape with traces of pine. Flavours are crisp, low bitter grapefruit with herbal aspects and base biscuit. Piney with plenty of spiciness and citrus rind pithiness. Very drinkable. Dangerous beer. "This is delicious! Go on then, I'll have another pint. Oh, I suddenly have seven empty pint glasses in front of me and I've missed my train..." Great tasting and moreish. Cask at Oliver Twist Stockholm. Amber colour with only some rests of a formerly beige head. Carbonation is very low. Aroma is malt, hops and fruit. Taste is malty with hop bitterness and a pleasant citrus hint. Good real ale. Different. Cask at The Lyric, Soho, London. A golden/amber coloured pour with a small white head on top. Hoppy, malty, citrus aroma. Tastes hoppy, malty, citrus fruit, some tropical fruit too.